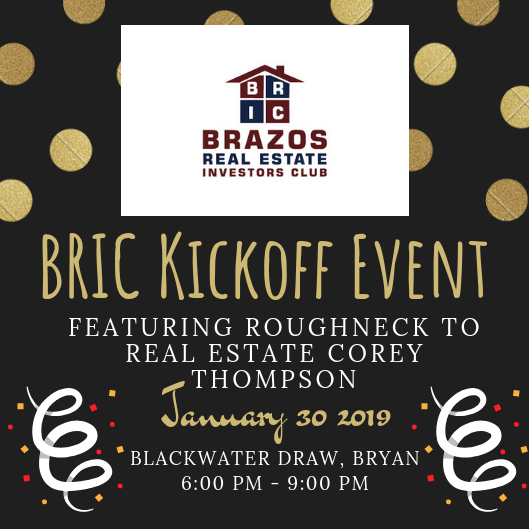 BRIC | January 2019 Kickoff Event with Roughneck 2 Real Estate Corey Thompson! January 2019 Kickoff Event with Roughneck 2 Real Estate Corey Thompson! This is THE event you won't want to miss! Our January kickoffs are always a BIG HIT...this time we're bringing Corey Thompson with Roughneck to Real Estate to kick of the new year! All the fun excitement January 30th at BlackWater Draw, in Bryan. BRIC's January kickoff event is sure to be a BIG HIT!...We're bringing Roughneck 2 Real Estate Guru COREY THOMPSON to the stage! Growing up in Groesbeck, TX Corey went into the oil field where he graduated with a degree in Roughneck. He spent 15 years traveling all over the country to different locations drilling oil wells and managing multi-million dollar projects. In March of 2015, due to the downturn in the oil field, Corey was laid off and was forced to find a new career path and landed on real estate. Since then he has been the catalyst for over $15 million in real estate transactions and projects across Texas. He currently resides back in his hometown of Groesbeck with his beautiful daughter, Emery. Come out and join the fastest growing (and only) Real Estate Investors Club in the Brazos Valley! Networking, Networking, and more Networking with food, drinks, and Investment information in downtown Bryan at Blackwater Draw. Food, Drinks and Networking start at 6pm at Best Western Premier Bryan / College Station. Session starts at 6:30 and will finish by 8pm with more networking until 9pm and beyond. Food, Drinks and room to spread out and network will be available throughout the Session.